A friend of mine has just shown me that great photo picturing 1st Cavalry troopers with strange M79s just before deployment in Vietnam. Do you know what modification was made or what accessory was used here ? Does this help? You have a neat picture. This prototype is in the South Carolina Air National Guard Museum. Well worth a trip. Look up the director Buddy and tell him Doc said "Hi". Sorry for short response. Time for work. BTW, the photo is for sale on ebay at the moment. Taking it slightly off-course, it's also a really neat photo because it appears to show all three patterns of OG-107s in use at once. Do you know how many prototypes have been build? So, the only thing I can figure is that the whole 3-round holder moves through the weapon like a solid belt. Any thoughts? When I first looked at the photo, I just thought maybe the device sticking out of the M79 was an extra cartridge holder. I did not shoot it but as near as I remember it is as you said ("3 round holder moves through the weapon like a solid belt") like a giant harmonica gun. Can you post a link to your auction, if it is acceptable? I love that kind of melody ! Cool photo of the T148E1s. First time I've seen that many together in one image. As noted in the display card in Copdoc's museum photo, the T148E1 pre-dated the M79 and was the preferred design to launch the 40mm grenades developed a few years earlier. 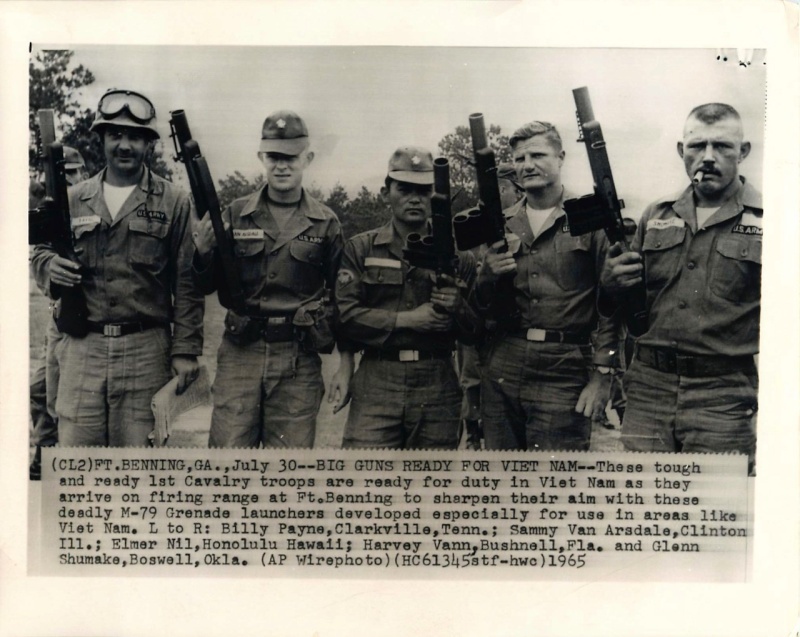 They felt the multi-shot launcher would provide superior firepower compared to the single-shot XM-79 and set up an experimental production run to work out the manufacturing bugs. Not sure about the total number produced but recall it was around 300 units. In testing, the unfortunate flaws of the harmonica feed design were discovered. The constant-force spring used to advance the feed block often failed to correctly locate the chamber for the next round. The gap between feed block and barrel allowed uneven gas venting and velocity variations from round to round. The greatest problem was simply the two big open chambers sticking out the side of the launcher that got fouled with sticks, mud, and other debris when carried in the field. So they were shelved in favor of the simpler single-shot XM79. The T148E1 still wasn't dead at that point, though. Complaints came in from Vietnam requesting a 40mm launcher with greater firepower than the M79. With several hundred T148E1s in storage, a maintenance manual was quickly printed at Rock Island Arsenal in 1966 and a bunch of them were sent to Vietnam for field testing. Of course, once they got out in the bush, all the old problems came back and were confirmed all over again. Here's a Vietnam photo of one in use with the 75th Rangers and a few views of the harmonica feed block. As you can see, it's a little more complex than it appears in other photos. Wonderful photos and outstanding info ! Thank you !!! 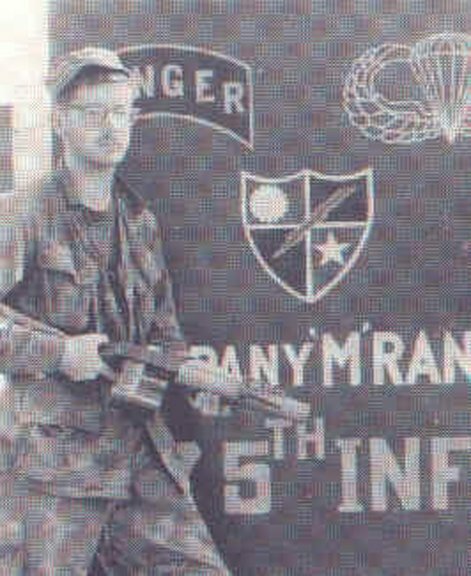 My father fired on of those at Ft. Dix in 1960.....I always wondered what 3 round grenade launcher he was talking about. Thanks!!!! I will be honest. I have never seen a pic of one of those types. I have seen the three shot barrel before on the bottom of the experimental version. I have definitely seen the pump-action M-79. On top of that I have seen the XM148 underneath of the M16 which was by far a waist of money and a mechanical nightmare. Thanks for showing me this Ordnance! Another US T148E1 Photo, note the M1 Garand Style Buttplate. Nice photo ! Thank you ! I actual won the above picture from Ebay. I used to work at the First Cavalry Division Museum and helped do alot of research on 1/9 Cav. As can be seen LTC Stockton was able to acquire several of the T148E1 for his Blues. They took them into the Ia Drang battles of 1965. Initially for ambush they loved them, but they were a bit complicated to reload with the rolling flat spring and that the "box" doesn't just snap in/out like a rifle magazine. Once the first three shots were done, it took almost as much time to reload as a regular M79, basically 6 shots out of either ended about the same time (it is interesting as this was also the case with the M1870 Remington single shot pistol vs. a Single Action Army type. With reload time, 12 shots ended about the same, saw a demo on this years ago)...and them there were all the quirks mentioned above. 1/9 soon removed them from service with their Infantry/Blue squads, but alot of the scout helicopter observers carried them as late as 1968.